that have regulated or banned commercial marijuana. licensed marijuana businesses to deliver anywhere in California regardless of local preference. and counties can block or restrict marijuana deliveries in their borders. For more information, please call the City Manager’s Office at 574-5401.
marking an important step in the identification and preservation of historic buildings throughout the City. The Survey identified a number of important structures, some of which rise to the State and National levels for historic significance. and commercial structures such as the Harold Bissner designed Denny’s building with its famous windmill. 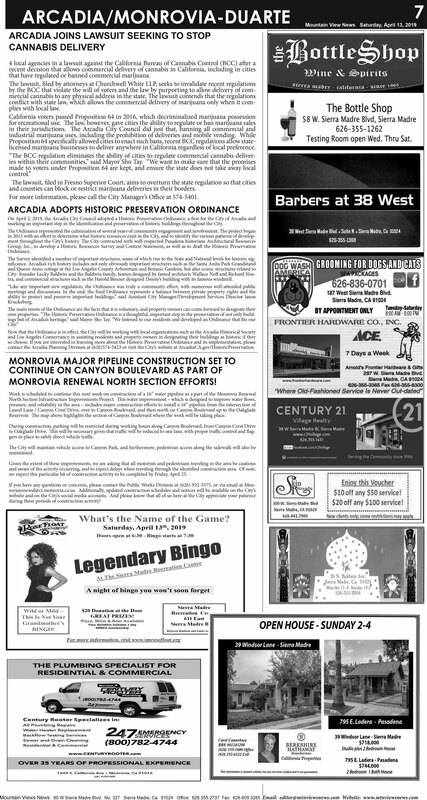 contact the Arcadia Planning Division at (626)574-5423 or visit the City’s website at ArcadiaCA.gov/HistoricPreservation. MONROVIA RENEWAL NORTH SECTION EFFORTS! Reservoir. The map above highlights the section of Canyon Boulevard where the work will be taking place. in place to safely direct vehicle traffic. we expect this particular bit of construction activity to be completed by Friday, April 25.
during these periods of construction activity! For more information, visit www.smrosefloat.orgWhat’s the Name of the Game? Recreation Center611 EastSierra Madre Blvd. Between Baldwin and Santa Anita Ave.
$20 Donation at the DoorGREAT PRIZES!